The Pacific War Online Encyclopedia: Deyo, Morton L.
Naval Historical Center #NH 56952. Cropped by author. 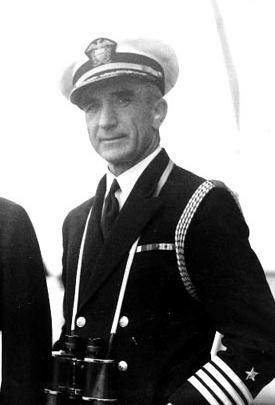 "Mort" Deyo had helped evaluate proposals for aid to China as aide to the Secretaty of the Navy in 1940. He commanded Destroyer Squadron 11 in the Neutrality Patrol in the Atlantic in 1941, a cruiser in the Aleutians, in late 1942, and a bombardment group (Task Force 129) at Normandy in June 1944. As long, however, as their fire is directed at our ships and away from the troops, we have no complaint. That is what we are there for. (Deyo 1956) Deyo was named to command Task Force 54, the bombardment group for the Okinawa invasion, after Oldendorf was injured in a launch that collided with a buoy. Deyo's flagship, Tennessee, was hit by a kamikaze during the campaign. Samuel Eliot Morison (1959) was aboard Tennessee during the preinvasion bombardment at Okinawa, and later claimed that he witnessed Deyo sniff the cordite fumes from the battleship guns and remark "That has a good, offensive smell!" Prior to the Normany invasion, Deyo let off steam by working out with a punching bag in his cabin (Atkinson 2013).